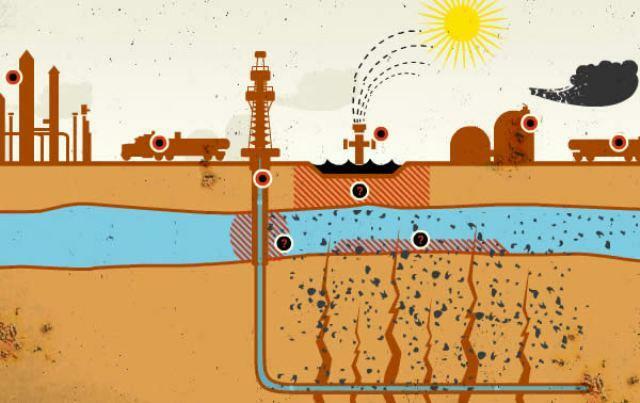 News that Shell Egypt and its joint venture partner Badr Petroleum Company had performed hydraulic fracturing using foam to tap natural gas in the Apollonia Reservoirs of Egypts Western Desert led to a call for a moratorium on the practice in 2012. The Western Desert makes up about two-thirds of Egypts land area and spans from the Mediterranean Sea south to the Sudanese border and from the Nile River Valley west to the Libyan border. While the area is sparsely populated, there are concerns that fracking could pollute groundwater supplies. The moratorium call was made by the Egyptian Initiative for Personal Rights, who called for independent impact studies and the development of regulations to cover the practice. Fracking, or plans to use fracking to extract gas, have been controversial globally because chemicals are used in the process, raising fears that it will pollute groundwater supplies. This is particularly relevant for Egypt, says the EIPR, because the country is dependent on limited sources of water. Newspaper reports indicated that no EIA report had been done for the project. In addition, two other companies are apparently also also involved in fracking. Apache (USA) was involed in fracking operations in wells in the East Bahariya field in the Western Desert, which contains aquifer systems of fresh groundwater on which both tourism and all agriculture by the inhabitants of the western oases depend. Agiba Petroleum (joint venture with Italian Eni, Russian Lukoil, and IFC) is also using the technology in its Falak and Dorra fields in the Western Desert. Project Details The two deepest gas fields in the Western Desert are named Assil and Karam: Shell anticipates that total production from the two will be 200 mmscf/d.. Together with drilling in other countries, Egyptian operations are part of a goal for the company to reach a target of producing 250,000 barrels of oil equivalent a day world-wide from oil-rich shale by 2017. Development of Alternatives -The Egyptian Initiative for Personal Rights (EIPR) is calling for an immediate moratorium on fracking until comprehensive studies are done to ensure that Egypt has the facilities to monitor the practice efficiently and to prevent the Nile becoming contaminated. -The organization has also called on Shell, Dana Petroleum, Apache and any other companies that frack to publish the chemical components used and processes of treatment and disposal. Why? Explain briefly. It is too early to tell. There have been calls for a moratorium on fracking, but there is already a project in operation in South-East Egypt. Egyptian Government (2005). Environmental Impact Assessment Guidelines for Oil and Gas Sector. Available at: Accessed 8 January 2013. Egyptian Initiative for Personal Rights (2012). Oil Companies in Egypt Use Controversial Technology Banned in a Number of Countries. Available at Accessed 14 January 2013. Royal Dutch Shell (2012). Royal Dutch Shell Takes Final Investment Decision on Alam el Shawish West Gas Development Project. Available at: Accessed 18 January 2013. Seeking Alpha (2013). 5 Hidden Oil Shale Plays For 2013. Available at: Accessed 27 January 2013. Al Jazeera English. FaultLines. Fracking in America. Daily News Egypt (2012). Shell to invest $600m in Western Desert operation. Available at: Accessed 8 January 2013. Twitter debate (2012). Available at Accessed 8 January 2013. Viney, Steven (2012). Are oil and gas companies fracking up Egypts environment? Available at: Accessed 8 January 2013. Unearthed Motion Pictures (2012). Unearthed: The Fracking Facade. Available at: Accessed 8 January 2013. Ecologist Film Unit (2012). Fracking Hell - The Untold Story. Available at Accessed 8 January 2013.